Nebraska had no answer for Melvin Gordon. Wisconsin’s standout junior running back broke the NCAA FBS single-game rushing record, racking up 408 yards and four touchdowns in the Badgers' dominant 59-24 win. Gordon's 408 yards came on 25 carries – a 16.3 yard-per-carry average. Gordon reached the end zone on runs of 62, 1, 6 and 26 yards on the afternoon, helping the Badgers storm back from an early deficit. 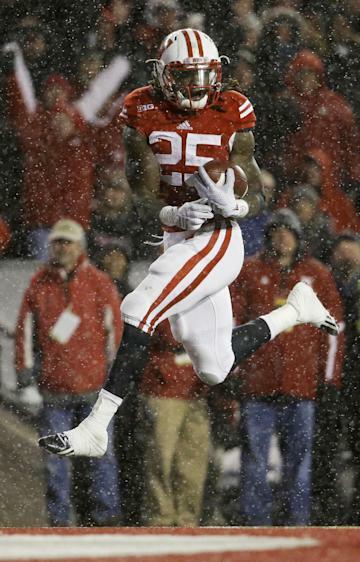 His final run – the 26-yard score – broke the record and gave the Badgers a 52-17 lead going into the fourth quarter. He also gashed the porous Nebraska defense for runs of 42, 39, 44, 43 and 68 yards on the record-setting afternoon. Gordon’s historic performance will undoubtedly vault him toward the top of the race for the Heisman Trophy along with Oregon quarterback Marcus Mariota. The previous record was 406 yards by TCU's LaDainian Tomlinson, who set the mark against UTEP on Nov. 20, 1999. Tomlinson, who went on to an illustrious career in the NFL, congratulated Gordon on Twitter. Gordon built on his nation-leading rushing output, and now is up to 1,909 yards rushing (190.9 yards per game) and 23 scores on the season. With two games left for the Badgers against Iowa and Minnesota, it looks like Gordon will be hard to catch for this year’s rushing title. Additionally, Gordon's 1,909 yards is fourth-best for a season in Wisconsin history. He is just 200 yards shy of Ron Dayne's 2,109 yards, a record Dayne set in 1996. The fun stats for Gordon don't stop there. Gordon has ran for at least 100 yards in eight straight games and 19 times in his career. The 189 yards Gordon accumulated in the second quarter broke Dayne's record of 170 set against San Jose State in 1997. Gordon tied Dayne's previous mark of 170 yards in the third quarter. While Gordon has been the unquestioned star of the day, the Wisconsin defense has forced four Nebraska turnovers and held the Huskers to just 179 total yards. When the Badgers trailed 17-3 in the second quarter, it was the defense that stiffened and allowed Gordon and the Badgers' offensive line to go to work. By the time halftime rolled around, the Badgers stormed back to a 24-17 lead. The second half was all Wisconsin. After their first second-half drive ended in a punt, the Badgers scored touchdowns on their next four possessions to put the game out of reach. The Badgers, ranked No. 20 in the country, knocked the Huskers out of the top spot in the Big Ten’s West Division with the win. If the Badgers take care of business against the Hawkeyes and Gophers in the coming weeks, Wisconsin will head back to the Big Ten Championship Game. For more Wisconsin news, visit BadgerBlitz.com.